The AF-S VR Micro-NIKKOR 105mm f/2.8G IF-ED’s long reach and built-in Vibration Reduction (VR) image stabilization bring new possiblities of handheld macro shooting. The lens delivers crisp yet natural images in any genre of photography. The longer focal length offers ample working distance when shooting close-ups of flowers, insects and other small wildlife. It’s medium-telephoto angle-of-view even creates beautiful portraits. Nikon VR (Vibration Reduction) image stabilization provides 3.0 stops* of blur free handheld shooting, assuring dramatically sharper still images and HD video capture. 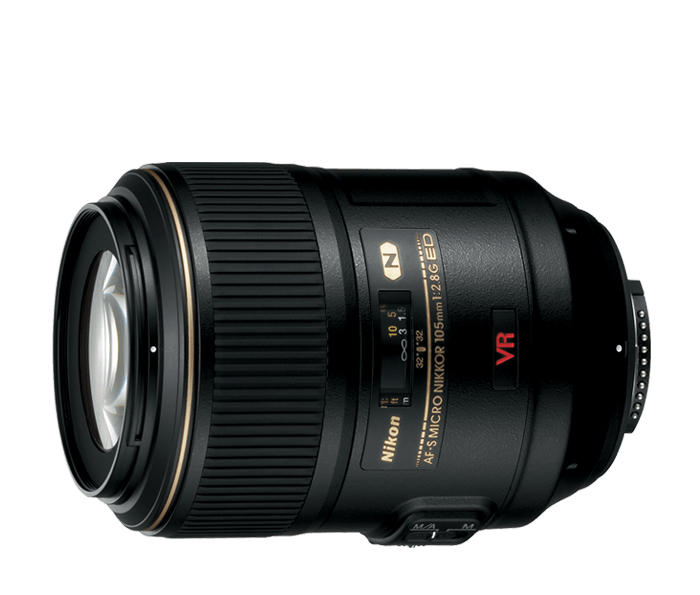 The AF-S VR Micro-NIKKOR 105mm f/2.8G IF-ED’s remarkable performance is the result of Micro NIKKOR’s rich legacy in the field of close-up photoraphy combined with innovative Nikon lens technologies. From its superior VR image stabilization system to its ultra-fast, ultra-quiet Silent Wave Motor (SWM), the AF-S VR Micro-NIKKOR 105mm f/2.8G IF-ED is an advanced lens the empowers the full potential of advanced D-SLRs.